The Summit Park Clubhouse, 8201 Henry Ave. Happy HOWLoween from the animals of ACCT Philly! Ready to trick or treat this Halloween? 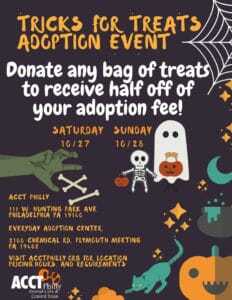 Join us for our Tricks or Treats Adoption event: bring a bag of treats to either our Main Shelter or our Everyday Adoption Center and receive half-off your adoption fee! Stop by The Link in University City for free food, door prizes, and meet adoptable pets from ACCT Philly! This is a KID FRIENDLY event. 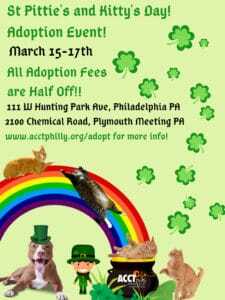 ACCT Philly and PetSmart Charities present NATIONAL ADOPTION WEEKEND! November 9, 10, and 11th receive half-off adoption fees at our Everyday Adoption Center (EAC) in Plymouth Meeting! 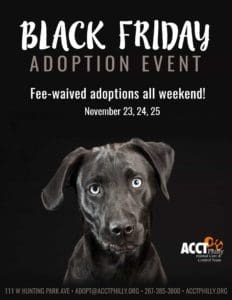 What better way to shop on Black Friday than adopting a new furry family member for free! Fee-waived adoptions all weekend - November 23, 24, and 25! 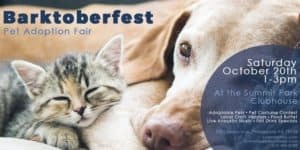 This event takes place at our Main Shelter, with adoption hours of 10 - 5 each day. 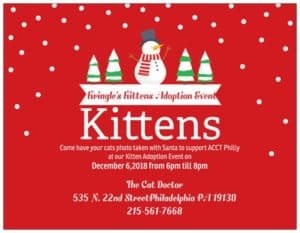 Join us for our annual Kringle's Kittens event on December 6th from 6-8pm with out hosts, The Cat Doctor, for a fun feline filled evening! Bring along your feline companion for photos with Santa or adopt an adorable new feline friend! Celebrate the holidays with felines, food, wine, and raffle prizes! 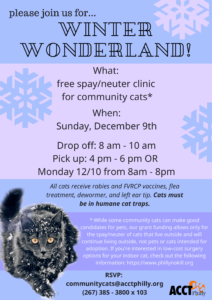 Donated cat items would be greatly appreciated as well! 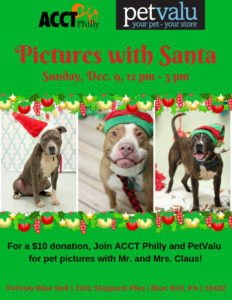 Join ACCT Philly at the PetValu Blue Bell for photos with Mr. and Mrs. Claus! From 12-3 pm and for a $10 donation to ACCT Philly, bring your pets in their best holiday outfits for photos with Santa himself (and Mrs. Claus of course!) Adoptable ACCT pets will also be making an appearance, so your holiday wishes may just come true and you may head home with a new furry family member! 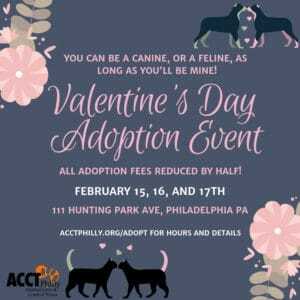 Join us and the Temple Tails crew for a winter adoption event and opportunity to raise funds for some of the animal shelters of Philadelphia! 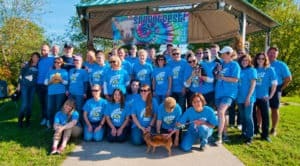 Win a raffle, meet some therapy pigs, and adopt a shelter pup all in one spot! 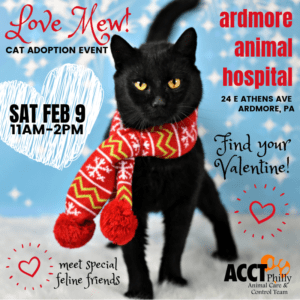 Come meet lovable adoptable kitties on February 9th at Ardmore Animal Hospital from 11am-2pm. Find your Valentine to fill your home with love and to keep you warm and cozy this winter! 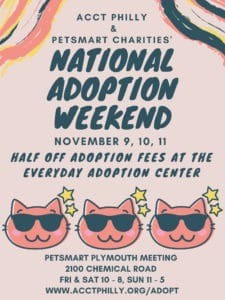 Join us at our Everyday Adoption Center in Plymouth Meeting for PetSmart's National Adoption Weekend! 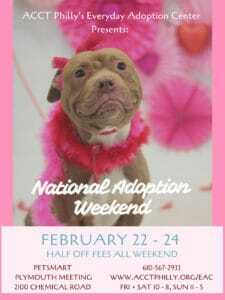 This adoption event is February 22nd, 23rd, and 24th - Friday, Saturday and Sunday- and all adoption fees are half-off! Feeling lucky? 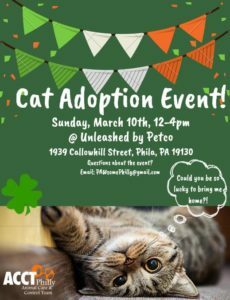 Join us March 10th from 12-4pm at Unleashed at Petco Callowhill to adopt a kitty. They'll be the lucky ones!